Brownhills Barry and Clayhanger Clive: New Blog Site! Hello again, It's Barry here. Clive is also here but not really offering a lot of input at the moment. He's too busy collecting and collaborating. I've been monitoring this blog since I moved to the new site at http://brownhillsbarry.wordpress.com/ and I'm still seeing a number of visitors to this old & original blog. I'm urging you all to forget this old blog and bookmark the new one over at Brownhills Barry and Clayhanger Clive at Wordpress. Hopefully you should arrive at the site and will be greeted with a view similar to the below image, depending on what the latest post is showing. 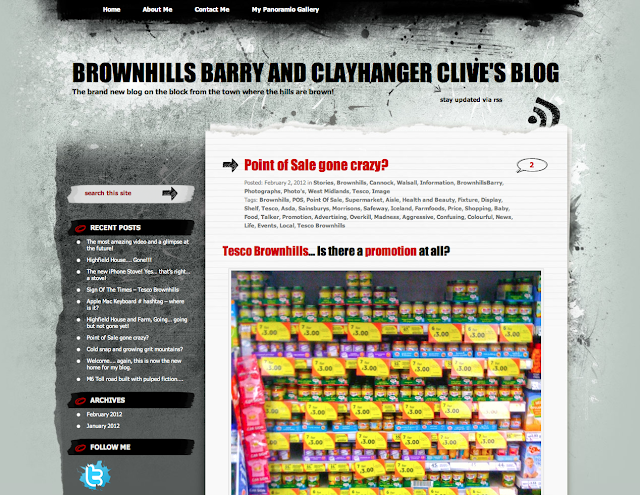 The best Brownhills Blog on the block - Created by Brownhills Barry and Clayhanger Clive. Well, there you go people... not much left to say apart from stop reading this and get your browser clicking onto the new Brownhills Blog. Please.... please feel free to contact me if you have anything interesting to share or have any requests, plus don't forget to bookmark the new blog! Follow me on Twitter and Facebook too! - The Most Amazing Video And Glimpse At The Future! - Highfield House... Going... Going... But Not Gone Yet! - Point Of Sale Gone Crazy? Brownhills Barry and Clayhanger Clive.